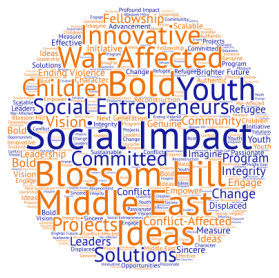 Blossom Hill Foundation is thrilled to announce that the application for our third year of the Blossom Hill Fellowship Program is now available on our website! There are two tracks of funding: Emerging Leader Fellows, eligible for up to $10,000 a year; and Sustaining Impact Fellows, eligible for up to $50,000 a year. All completed applications must be received by Monday, April 16, 2018. · Project beneficiaries: Project must aim to positively impact the lives of communities (children, youth, families, etc.) affected by conflict and war in the Middle East. This can be in the Middle East itself or any other country where war refugee populations have needs. · Experience: Applicants should have significant experience and close ties with the community and culture their idea is designed to serve. · Language proficiency: Applicants should possess the language skills necessary for the successful implementation of their proposed initiative. · Partner: Applicants must have a partner NGO registered as a U.S. 501(c)(3) charitable organization to serve as a fiscal sponsor. In three days, Harvard’s Synergy gives you the skills, mentorship, and network to create your own startup. Hosted by the Harvard Social Innovation Collaborative (SIC), the signature conference at the university in Cambridge, MA from January 17 – 19, 2018, covers product ideation, business modeling, marketing, investor pitching, and other aspects of creating a successful social enterprise. Past participants have created space-efficient homeless shelters, a computer science academy for Zimbabwean students, and other worldwide startups. Visit their website for more details, or apply here by November 30th, 2017. The IDEX Accelerator & Global Fellowship Program has an upcoming application deadline of October 15th for their January 2018 cohort program. The program was founded on the idea that by investing in the future generations of leaders who are passionate about leading high-impact careers, we can regenerate local economies and build stronger communities around the world. There is a tuition involved but there are also scholarships within the IDEX system to cover many expenses such as travel. For instance, IDEX founded the InvestWISE Scholarship Fund in 2014 and made it a core part of their mission to help balance the gender scales to place more women in leadership roles within specialized impact fields such as Agriculture, Clean Energy, Impact Investing, Technology for Development and Public Policy. Check out the program here: http://www.idexaccelerator.com/. IDEX is a US based non-profit that was incubated under Gray Matters Capital in 2010 with the objective of developing the next wave of “social intrapreneurs” who will support, lead and advance the work of socially-focused enterprises around the world! IDEX Fellows undergo six months of leadership and business development training by working full-time for social enterprises across India. IDEX Fellows work in areas including health, education, gender, energy, livelihood, environment, impact investing etc. Currently, IDEX alumni come from all corners of the globe. Are you a Junior Feb, Sophomore, or Sophomore Feb interested in social change here at Middlebury? Do you want funding to reflect and think deeply about issues of social justice here and around the world? Do you want access to a like-minded cohort, experienced mentors, and a powerful changemaking network? If you answered yes to those questions, the Middlebury SE Fellowship and ChangeMaker program is for you! Whether or not you have a specific project in mind, we welcome students from all identities and academic backgrounds to apply. The social entrepreneurship program equips students to become effective agents of change. Fill out the application form at go/sefellowship2017 by 11:59pm on Friday, September 29th, 2017. Details are available in the form, and questions can be directed to Jiya Pandya at jpandya@middlebury.edu. We’re so glad you are here. Please explore these pages as you uncover your passion for a career with “Social Impact.” Let us know if you have any questions on the information you find here.